England's fourth-largest city lies approximately 35 miles south of Leeds on the Don and Rivelin rivers at the foot of the Derbyshire Hills. An industrial city, Sheffield is a popular base from which to explore the Peak District, which is known for its bucolic vistas, manor homes, mining towns, and mineral springs. Sheffield also has many well-tended parks and a beautiful greenbelt area for plenty of outdoor fun. Also popular, particularly among gardeners, is the 19-acre Sheffield Botanical Gardens. When you're through enjoying the city's many green spaces, it's well worth visiting the center of this university town, where academic institutions have long worked closely with local industry, the most recent example being the Technology Park near the technical college. Sheffield is famous for knives, all types of cutting tools, guns, and high-grade steel production, a fact Chaucer refers to back in 1478 in his Canterbury Tales when he describes a "Sheffield thwitel," the ancestor of the modern pocket knife. Once made in home workshops, Sheffield's fine cutlery is still exported around the world. A Grade-II listed site, the beautiful 19-acre Sheffield Botanical Gardens were established in 1836 and showcase more than 5,000 species of plants. This is a lovely spot for a stroll - especially in the spring and summer, when many of the plants are in full bloom. Highlights include the glasshouses, also Grade II-listed, with temperate plants from Australia, Asia, and South Africa; the Victorian Garden; and the Four Seasons Garden, which is colorful at any time of year. The gardens are a great spot to take the kids (look for the friendly squirrels), and many music, art, and theatrical events are staged on the grounds. After exploring all the botanical beauties, you can relax at the on-site café. Best of all, admission is free. Other popular gardens in Sheffield include the Winter Garden, with more than 2,500 plants in one of the UK's largest temperate glasshouses, and the nearby Peace Gardens, where water features take center stage amid patches of perfectly manicured lawns and plenty of cafés. About three miles south of the city center, Graves Park is the city's largest public green space and offers a fun line-up of things to do for the entire family. Children love the Graves Park Animal Farm here, where they can see several rare breeds of farm animals and get up close to goats, llamas, and donkeys. Two playgrounds are also in the park for kids who want to burn off steam, and a little train skirts the ponds during weekends and school holidays. Other popular activities include exploring the nature trails; casting a fishing line in the pond; and sports such as cricket, tennis, and football. After all your active adventures, you can enjoy a snack at the café. More than just butterflies, the Tropical Butterfly House is also home to meerkats, lemurs, farm animals, otters, owls, reptiles, free-flying birds of prey, and brightly-colored parrots. Animal lovers can experience close-up encounters with some of the more charismatic animals.You can pat a lemur, meet the meerkats, learn all about otters on a keeper's talk, feed the farm animals, and spend hours photographing the butterflies up close. If you're hungry after meeting all the animals, the cafe here serves lunch, snacks, and afternoon tea with homemade cakes. Kelham Island Museum - part of the Sheffield Industrial Museums Trust - focuses on exhibits related to Sheffield's industrial past, in particular steel and silverware from the past 300 years. Craftspeople can be seen at work in the Little Mesters workshop, while the museum's huge River Don steam engine, built in 1905 and used at one of the local steel mills, is regularly put through its paces. The museum also boasts an impressive collection of tools, along with historic vehicles. The area round the museum has also undergone a fair amount of redevelopment since its industrial heyday and is now popular for its dining and shopping. Dedicated to St. Peter and St. Paul, Sheffield Cathedral stands on the site of a parish church founded in 1100. The new church, built in late-Gothic Perpendicular style, replaced it in the mid-15th century (only the choir and the tower remain, and the nave was built in the late 18th century). When Sheffield became the see of a bishop in 1914, plans were afoot to make the present nave the transept of a new and much larger church, but this project became a casualty of the two world wars, leaving the church with its unusual ground plan. Inside the cathedral, note the font, donated in 1884 by Freemasons, and the marble tomb of the Earl of Shrewsbury (d. 1538), which shows him between his two wives. The unusual black oak portable sedilla (the seat used by the bishops) in St. Catherine's Chapel dates from the 15th century, while the main decoration provided by the colorful stained glass windows in the Chapterhouse depict the city's history (these were added in the 1960s). The most interesting of these, the Chaucer Window, shows the miller of Trumpington (from the Reeve's Tale) with his Sheffield knife. In addition to its popular coffee shop, the cathedral also hosts regular educational programs and guided tours. Sheffield's largest museum, Weston Park Museum was originally founded in 1875 to house the Mappin Art Gallery, an impressive collection of artworks given to the city by a local businessman who profited from the steel industry. The facility's mandate grew over the years and today houses Sheffield's natural history, archaeology, social history, and decorative art collections. Highlights include reproductions of Bronze Age art and armor, some 250 paintings from area artists, along with numerous visiting exhibits from larger museums. Weston Park itself, comprising the grounds of the former estate, is also fun to explore. The National Emergency Services Museum - billed as the largest such museum in the world - is a must-visit when in Sheffield. Highlights of the museum's vast collection are more than 50 vintage vehicles, among them numerous fire engines, police cars, and ambulances, along with uniforms and equipment. For a truly special treat, these historic vehicles can be rented for a city tour or private functions, and regular kids' fire engine rides are included with admission. Also worth checking out are the old prison cells and the police horse stables. Just three miles southwest of Sheffield's city center, Abbeydale Industrial Hamlet is a fascinating 18th-century Victorian village, where visitors can learn about the traditional production of steel scythes. This interesting tourist attraction features warehouses, workers' cottages, water wheels, tilt hammers, a grinding hull, and workshops, as well as the UK's last intact crucible steel furnace. A new addition is the attraction's Learning Centre, used to host educational programs, and where you'll find a first-rate café. In a similar vein, the historic Shepherd Wheel on the city's Porter Brook allows visitors a chance to get an up-close look at one of the country's last surviving water-powered grinding workshops. Opened in 1934 above Sheffield's Central Library, Graves Art Gallery contains an excellent collection of old masters and English art from the 18th century to the present day, along with major artists of the 19th and 20th centuries such as Cézanne, Corot, Picasso, and Braque. Other notable artworks include a collection of fine portraits as well contemporary paintings and sculptures. Art lovers will also want to visit the nearby Millennium Gallery featuring metalwork, contemporary art, and design exhibitions, as well as the city's unique Ruskin collections. It also hosts touring exhibitions from partners including the Victoria and Albert, the Tate and the National Portrait Gallery. Also close by are the Lyceum Theatre and the Crucible Theatre, reopened in 1990 after extensive restoration, and the fascinating Site Gallery, home to an eclectic mix of moving images, new media, and performance art. 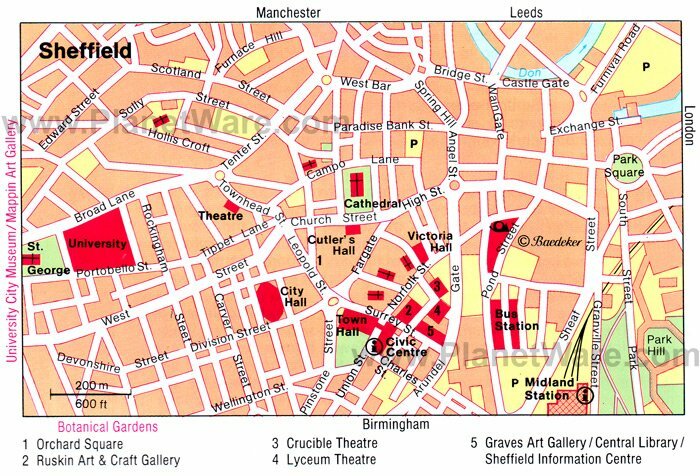 The colorful pedestrian precincts of Orchard Square and Fargate, with their numerous shops, restaurants, and cafés, lead south to Surrey Street, site of Sheffield's Victorian town hall. This impressive neo-Renaissance building was erected in 1897 and enlarged in 1910 and 1923 and is notable for its 193-foot-high tower topped by a figure of Vulcan, the blacksmith god (look closely, and you'll see he's holding aloft the arrows he just forged, symbols of Sheffield's predominant steel industry). East of the Town Hall is Tudor Square, home to several museums, theaters, and Sheffield City Hall. Castle Market and Castle Square, to the north of Tudor Square, are modern, partly underground shopping centers. Construction of the small timber-framed Bishop's House, the best surviving such structure in Sheffield, began in the 15th century, with further sections added during the 16th and 17th centuries. Its building history is explained in two rooms, and other exhibits concern Sheffield's history during the Tudor and Stuart periods. Bishops' House also hosts art and cultural events and is a popular venue for folk music concerts, family gatherings, and weddings. Another interesting historical building worthy of a visit is Sheffield Manor Lodge, a well-preserved Tudor manor house that boasts a working farm and wildflower meadows. About 10 miles from Sheffield, the Elsecar Heritage Railway is dedicated to the preservation, restoration, and expansion of one of the area's oldest railway lines. Highlights include an impressive collection of historic locomotives and rolling stock that once belonged to the South Yorkshire Railway. Budding engineers can even learn to drive a steam train through one of the railway's "footplate" courses (they also offer a number of fun themed excursions). The railway is adjacent to the Elsecar Heritage Centre, an antique, history, and craft center within the former ironworks and colliery workshops. Also of interest to transport enthusiasts is the South Yorkshire Transport Museum in Rotherham, with its collection of 50 vehicles including buses, a tram, a locomotive, and tractors. Beauchief Abbey, which combines the remains of an abbey founded in the mid-12th century and a chapel built in 1660, is well worth a visit (guided tours can be arranged with advance notice). The abbey still hosts regular worship services, but check ahead for schedules. A highlight of a visit is the chance to explore the magnificent ancient woodlands nearby, including Parkbank Wood, Old Park Wood, and Ladies Spring Wood; the latter is popular among birdwatchers for its many rare species of woodpecker. These old forests are wonderful to explore thanks to the many well-marked public footpaths that crisscross the area. The coalmining town of Worksop, 17 miles southeast of Sheffield, offers several interesting things to do. Most popular for visitors are Worksop Priory; the Circle Arts Centre, featuring live music and arts performances; and Clumber Park, which boasts one of the longest glasshouses in England, along with expansive parkland, woods, open heath, and farmland. The area was once home to the Dukes of Newcastle, but all that remains of the estate are the Gothic Revival Chapel and the Victorian walled garden with the glasshouse. Also worth a visit is Mister Straw's House, an Edwardian house with displays of Victorian furniture, family mementos, and a garden. Mercure Sheffield St. Paul's Hotel: 4-star spa hotel, contemporary building, stylish decor, heated indoor pool, sauna. Brocco on the Park: mid-range B&B, super stylish decor, thoughtful touches, freestanding baths, delicious breakfast. Hampton By Hilton Sheffield: 3-star hotel, comfortable rooms, hot breakfast included, exercise room. Premier Inn Sheffield City Centre (St. Mary's Gate) Hotel: budget hotel, modern decor, comfy beds, family rooms.